Italy is a European country that has a captivating charm of its own. The trip to Europe would be incomplete without visiting this country, which is deeply rooted in history. One cannot count the numerous things that make this country so popular. Roman Empire, pasta, pizza, opera, architecture, museums, palaces, churches, and of course, beautiful women and handsome men all account for the country’s glory! However, we will tell you the top five destinations that are a must-visit on an Italian trip. Rome is a historical and cultural city. Its existence dates back over 2,500 years ago. Over the years, the city has evolved from being a seat to the Roman Empire to a comprehensively developed European city. Today it boasts of being one of the wealthiest cities in the European Union. Rome contains countless places that hold significance to the Western Civilization. 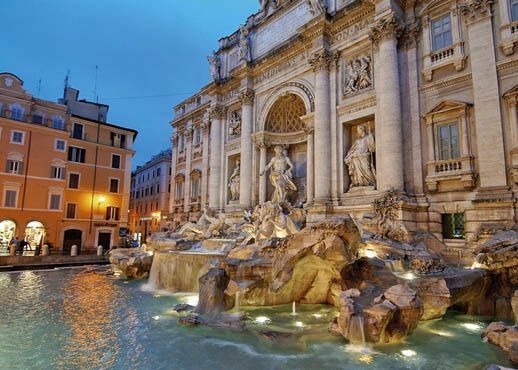 Tourist must visit the Pantheon, the Colosseum, The Spanish Steps, the Sistine Chapel, and Trevi fountain. If you can manage to take a tour of the Catacombs, do that, it is incredible! Milan is the fashion capital of Italy. The city thrives on fashion, sports, music, and art. If you are visiting the first time, catch the opera concert at La Scala, shop at Piazza del Duomo, considered to be the world’s first shopping center and without saying an A.C. Milan football game. Milan reverberates the history of World War II along with that of Benito Mussolini and Napoleon. Stopover at Milan Cathedral, and catch a glimpse of Da Vinci’s The Last Supper at the Convent of Santa Maria delle Grazie. Treat your hungry stomachs to a delectable meal in the city. Select your favorite airline to book cheap tickets and Grab as much as food you can, food in this city is fantastic! Italian holiday is incomplete sans a trip to this beautiful city. Venice is graceful and romantic. Navigate your way through the snaky passageways and canals to clutch the true flavor of the city. Bridges and canals connect parts of the city with one another. Drop by at Piazza San Marco, the famous public square in Venice and then hop into a gondola for a ride down the Grand Canal. Watch the spectacular landscapes from St. Mark’s Campanile. Last but not the least, sip a cup of coffee at Caffe Florian, treated as the world’s oldest coffee house. The city is famous for its fashion neighborhoods and Chianti wine. Florence is a UNESCO World Heritage site and houses many places of interests. When in town you must not forget to visit Ponte Vecchio (which means old bridge in Italian), Florence Cathedral, Medici Chapel, Boboli Gardens, and Ufizzi Gallery. Shopaholics should head straight to Via de’ Tornabuoni that is home to lavish boutiques. Finally raise a toast to the glass of Chianti to celebrate your tour of this beautiful city. The city is about 3,000 years old and is a spectacle in itself. Stunningly beautiful, Naples shares a close proximity to Mount Vesuvius. Being a part of history, Naples calls for an exploration of its history. Visit to the Medieval Castell dell’Ovo, Piazza del Plebiscito, and the Naples Archaeological Museum is necessary! Neapolitan ice cream, the Margherita pizza and gelato ice cream are natives of this city. Therefore, you have an option to delve into the culinary expertise of Naples too.